Are you aware of every change that happened in your Microsoft SharePoint Server environment? Can you be sure that no critical action went under your radar? 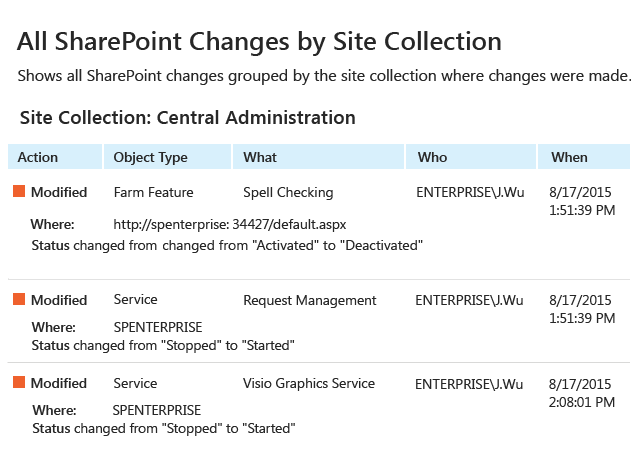 Efficient SharePoint change tracking can bring you peace of mind when it comes to detecting suspicious changes, such as the deletion of a document library or the modification of farm configuration settings that could result in a data breach or disrupt system operations. Having such insight at hand enables you to investigate security incidents faster and respond before it’s too late. Every change in your SharePoint ecosystem matters. If there’s an inappropriate change to farm configuration or mission-critical content is deleted, for instance, you need to be the first to know about it, so you can minimize the risk of compliance failures and security violations. Therefore, you need to track changes to SharePoint site collections and efficiently identify possible risks in order to protect your critical assets. To keep an eye on changes across your SharePoint sites, you can use native SharePoint tools. The first step is to activate the reporting features via Site Collection Administration. Then you need to set automatic trimming of the audit logging and define the trimming time range. You can view the reports that are provided in table format; however, the reports can and do miss critical detail that could expedite detection of suspicious activity that needs your immediate attention. On top of that, you need to specify where the audit log will be stored and ensure there is enough free disk space to exclude the risk of overwritten logs. But is there a simpler and more secure way to stay abreast of changes in SharePoint? Maximize visibility into SharePoint by keeping an eye on read access to sensitive documents and list items, thereby hardening data security even more. Ensure no improper changes or data access goes unnoticed by reviewing easy-to-read, detailed predefined reports. Save valuable time on reporting with the report subscription option. Chase down threats in minutes by digging deeper into the root cause with the Google-like Interactive Search. Get a good night’s sleep by setting up custom alerts on the activity you deem most critical. Stress no more whether you have enough disk space left, because with the cost-effective two-tiered (file-based + SQL Server database) Netwrix storage, you can keep your data securely for years. Expand this visibility into SharePoint Online with Netwrix Auditor for Office 365.